Endurance by Aether Lighting is a range of LED vandal & weather resistant light fittings designed using our combined experience of over 100 years in the vandal resistant market. This century of knowledge has resulted in a British designed and manufactured range able to withstand extreme physical attack and severe weather conditions. Lighting specifiers, especially Local Authorities and Consulting Engineers. 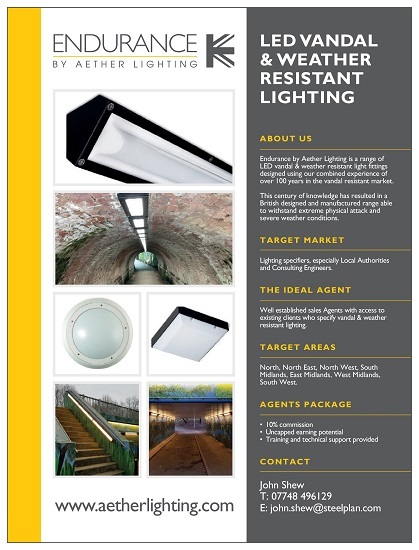 Well established sales Agents with access to existing clients who specify vandal & weather resistant lighting. North, North East, North West, South Midlands, East Midlands, West Midlands, South West.